Just two years ago, 40% of adults said they had tried marijuana. In both 2003 and 2001, 38% said they had used marijuana. In the latest Pew Research Center survey, conducted in March, the number of those saying they had ever tried marijuana climbed to 48%, the highest percentage ever. The survey found that a majority of Americans favor legalizing the use of marijuana for the first time in more than four decades of polling. Of the 48% who have ever used it, about a quarter of them – 12% of the general public say they did so in the past year. The other 36% say they have tried marijuana, but not in the past year. People who say they have used marijuana in the past year did so both for medical reasons and “just for fun.” About half (53%) of those recent users say that a medical issue was part of the reason for their use, including 23% who volunteer that they used marijuana for both medical and recreational purposes. 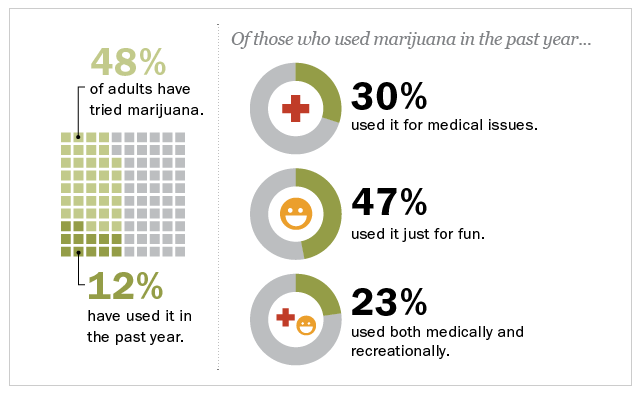 The remaining 47% say they used marijuana just for fun. (See also a slideshow with key findings from our latest survey about public opinion on marijuana and a timeline tracking trends on whether it should be legalized). More than half of young people (56%) say they have ever tried marijuana, and 27% say they have tried it in the past year – by far the highest percentage in any age category. About half of those 30- to 49 (51%) and 50-64 (54%) have ever tried marijuana, although only about one-in-ten did so last year. Just 22% of adults 65 and older have ever used marijuana, including 2% who say they have used it in the past year. Men are more likely to say they have tried marijuana than women, 54% vs. 42%. Half of whites and blacks (50%) say they have ever tried marijuana, compared with 34% of Hispanics.